thinking back, it’s kind of impressive how much stuff got crammed into day 26 on our Camino — the Castillo de los Templarios in Ponferrada, TAL episode #465, tasting at Cuatro Pasos, taking a potentially risky shortcut to shave off a couple of kilometers at the end of the day, Brent Spiner on the Nerdist, and the second-craziest shower I experienced while in Spain. I suppose it should come as no surprise then just how relieved we were to stumble into our boutique hotel in Villafranca del Bierzo, Hotel Las Doñas del Portazgo. (if you ever find yourself in Villafranca del Bierzo, I recommend it). the earliest settlements around Villafranca date from the neolithic age and there’s evidence to suggest it served as an important hub for communication during the Roman period, sitting as it does at the confluence of two rivers (the Burbia and Valcarce) at the western edge of the Bierzo basin and at the foot of the narrow pass that ascends to O Cebriero and Galicia beyond. in the 11th century, the sister of Alfonso VI granted a church to Cluny for establishing a monastery that began cultivating wine. this, along with the explosion of peregrinos during the 12th century, gave rise to a sizable foreign population including many French who aided developing wines. by the middle of the century more than half the town’s inhabitants were foreign. the city flourished for several centuries because of the Camino and in 1486 the Catholic Monarchs established the Marquesado in the town; the second man to hold the title, Pedro Álvarez de Toledo, built a castle though the one that overlooks the valley and town dates from the 1490s and was recently restored to clean up the damage done when the French burned it in 1812. following the second Marques’ death, the city endured its first of many significant hardships that concluded with the burning of the castle by the French. the plague decimated the town’s population in 1589; a flood washed out much along the river in 1715; during the Peninsular War the town served as headquarters for the Galician army and was sacked three times by the English until finally, after the municipal archives were burned, churches robbed, and castle wrecked in 1810 Spain regained control of the area. sort of — the French briefly occupied the town following the expulsion of the English. twelve years later el Bierzo was declared an independent province with Villafranca as its capitol; that lasted two years. much of the late medieval and Renaissance character remains in Villafranca (as much of the modern industrial revolution passed the city over) including several well-preserved churches. subsequent to its construction in 1186, the Iglesia de Santiago offered ailing peregrinos an alternative to crossing the remaining 187 kilometers of the Camino; if you were too ill or too injured to continue on to Santiago you could pass through the northern entrance — the Puerta del Perdon — and receive a pardon for your sins as you would at the cathedral in Santiago if only you were physically capable of continuing onward. along the narrow streets are facades you might imagine lining prosperous towns of the middle ages — sturdy construction with impressive stonework — though care for these buildings varies widely. our hotel stood at the end of one such street; it used to serve as the gatehouse for the bridge over the rio Burbia and has been attentively restored and updated; while the entire place exudes comfort, during the update process they left elements of the original building exposed to give a sense of what the place might have felt and looked like a century ago. while the hotel at the end of the road was lovingly restored, there were many other buildings along the way that hadn’t received the same attention. from the refurbished window balcony of one updated home you could look directly into the dilapidated and burned-out husk of another once-magnificent home that hadn’t received the same attentions. Villafranca del Bierzo was clearly thriving, but it didn’t take much to see signs of the common challenges afflicting the rest of Spain. one of the more memorable things about the day coming the Cruz de Ferro after leaving Rabanal was how many more peregrinos there seemed to be than in previous days. the number had been growing, to be sure, since we’d gone through Astorga, but the number struck me on day 25 — perhaps because there were so many new faces, not all of which were welcome additions to the rotation of walking companions. this last leg quickly became a test of patience when it came to new faces who had yet to grow accustomed to the hardships posed by the Camino (i.e. blisters). one woman we encountered on the descent did.not.stop.talking. the entire climb down to Molinaseca. after following along behind her for about 30 minutes as she regaled her companion with all manner of stories about her children, life, work, anything, I discovered (in having to sit at an adjoining table at the only cafe in town where we stopped for a mid-morning snack) that she’d only know said companion for a matter of hours! the majority of which, presumably, she’d been pouring out her life story heedless of her companions attention or interest (but what do I know, perhaps that “unsuspecting companion” was approaching all manner of peregrinos soliciting life stories and this Canadian woman was happy to oblige [yes, I know she was Canadian. I couldn’t help learning that she was Canadian]). it was a warm day and the downhill grade was a different, if not entirely welcome, challenge after crossing the mesetas. we passed through two small villages, both hosting albergues and other lodging , though clearly struggling or abandoned outside the immediate radius of those establishments. the buildings were older and wood timbered; the two-story stone buildings lining the through-road in the first village had overhanging second floors, sticking out slightly over the narrow, cobbled road. the second village was much the same; it was an interesting approach and exit — not unlike walking through someones back yard or along the edge of someones property to get into town, which felt different in comparison to all the times we approached via the road into town that has been the road into town since Roman times. as a counterpoint to Rabanal, Molinaseca also served as an important point along the trail of Roman gold. the town sits at the base of a gorge created by the rio Meruelo. as we crossed over the river on one of the two remaining medieval bridges, we saw a pair of women — obviously peregrinos, probably much newer to the Camino than us — wading in the water. previously we’d heard cautions against wading in water with which you weren’t familiar; with all the potential infection sites peregrinos might develop on their feet, seemed like sound advice no matter how refreshing a wade in a cool mountain-fed stream might sound. even without the period furniture and amenities of a suite or plaza-facing room, our digs were pretty great. 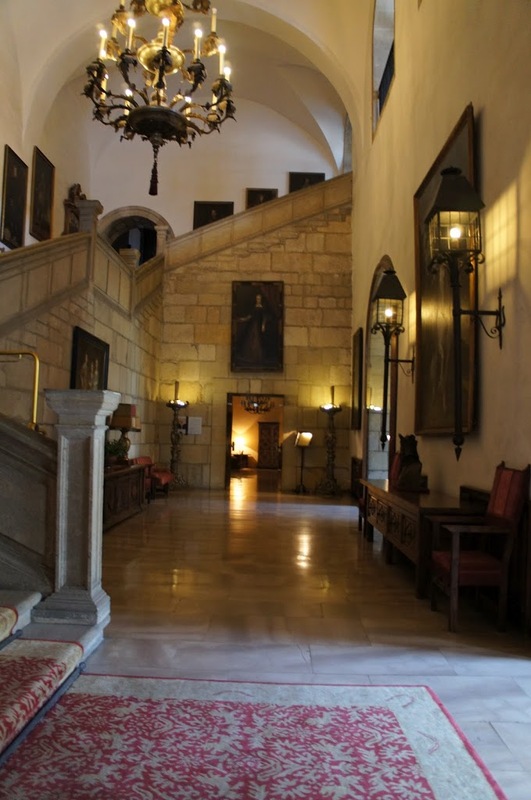 the Parador in Santo Domingo offered some of the period touches — square windows covered by thick wooden shutters, sturdy wooden furniture with decorative draperies, tapestries on the wall — and the one in León still had our most desired features: comfortable beds and a nice big bathtub that filled with steaming hot water. it also had a private-enough balcony overlooking a tiny courtyard and a governmental building — after walking for 20 days straight and covering more than 336 kilometers all we needed or wanted was someplace comfortable to rest and recover from our aches. and to sleep in as late as we wanted. that was fabulous, too. highly satisfying and relaxing, our experience at the Parador was also interesting; they book rooms for plenty of peregrinos, to be sure (and even once offered free dinners to the first 10 peregrinos to arrive every day which, eventually, they had to relegate to a separate dining room because of “offensive odors”), ready for a little luxury after (perhaps) 20 nights in albergues with varying degrees of comfort or amenities, but it’s also without question an upscale (5-star) hotel aimed at wealthy travelers and business people. valet parking, pricey meals, concierge service, guests lounging in reception wearing designer labels of the understated, old-money school. in a way, then, maybe it was better we got a view of the Junta de Castilla y León from a simple cement balcony with wrought-iron furniture, stepping out of a nice, comfortable, well-appointed but not overwhelmingly upscale hotel room. if we’d gotten one of those snazzier, rock star rooms that Martin Sheen books for himself and his traveling companions I wager I’d have felt out of place; a hostel-bunk-sleeping, backpack-wearing, own-food-making, modern-day rambler wholly out of place among those who have people to fetch cars and bags — not unlike how I felt staying at the resort in Key West where it seemed almost as if everyone was speaking a foreign language (one that came from one’s relationship with money). 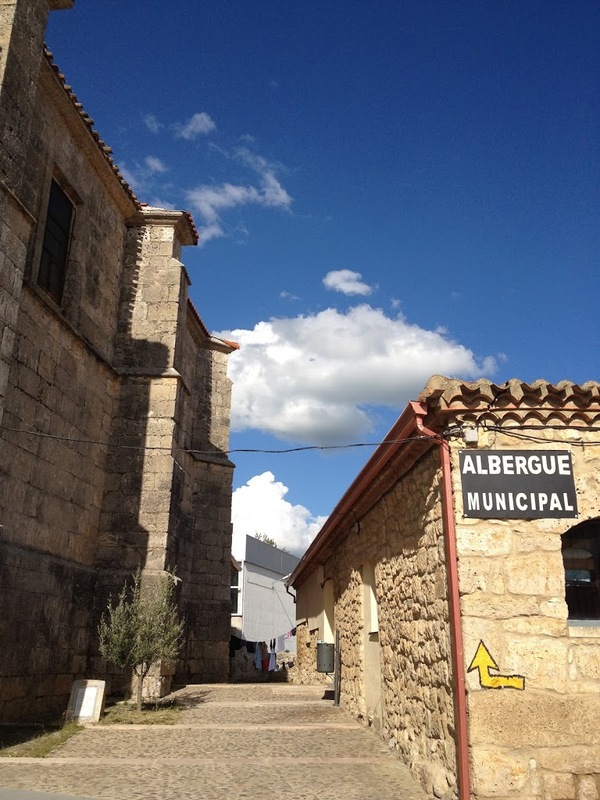 although the building is mostly ruins, it does still function as an albergue during milder months when Camino traffic is heavier. the most impressive remnant of the original monastery is the archway spanning the Camino. peregrinos arriving too late to gain access to the hospital shelter under the archway for the night and monks would leave food in the niches that line the walls. while residents no longer leave vittles in the alcoves, peregrinos often leave notes to one another, held down by stones or other weights. we saw notes left for people in quite a few places, but nowhere as many little scraps of paper as here. my books reference the remarkable artistry of the carvings lining the opposite side of the archway — in archivolts (curved ornamental moldings along the underside of the arch), which must have been truly spectacularconsidering how impressive they remain in spite of centuries of deterioration. at the west end of the ruins plaques featuring the insignia of the Order of San Antón remain, near what remains of the rose window and coats of arms from French and German families. the day we walked through Villafranca Montes de Oca we finally got chatting to a very social American couple from Virginia; it seemed they’d gotten the skinny on all the English-speaking peregrinos in our band and were, as we came to appreciate, very friendly conversationalists. they were also some of the first people we encountered who had their bags (containing the bulk of their luggage) transported from their starting point to their destination each day and only carried small daypacks with snacks, water, directions, whatever. whether their lighter packs or their general level of fitness, once we fell into conversation (and step) with them, we rather booked it to our half-way point for the day. maybe we would have made Villafranca by 11:00a.m. anyway, but the time certainly felt like it flew by. founded by the Romans (and perhaps before by Iron Age settlers as early as 700 B.C.E.) the sizable town of Auca (home to bishops the first of whom was purportedly named by Santiago himself) was partially destroyed during the Muslim invasion of the 8th century. the town never recovered its former power and glory and now the busy N-120 bisects it, carrying all manner of lorries past at top speeds. we stopped for food at the first cafe which our guidebook referred to as a “truck stop” where drivers fueled up before heading through the Puerto de la Pedraja. the hills divide two river watersheds — that of the Ebro (flowing into the Mediterranean) and the Duero (flowing into the Atlantic). 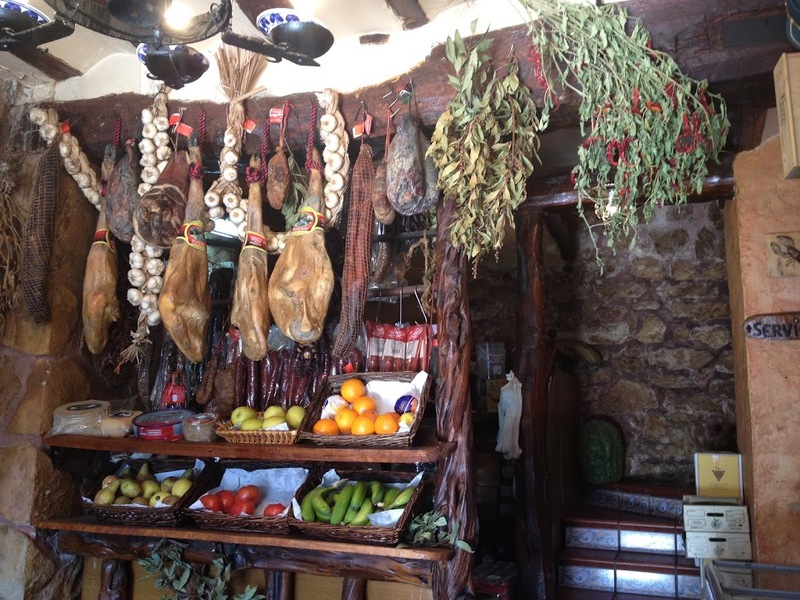 the cafe where we rested contained, among other things, dried pork legs hanging from the ceiling, ready for slicing up for a bocadillo de jamon. once rested and noshed, we climbed up into the eponymous Montes de Oca — desolate and hilly scrub land covering the surrounding countryside. the Camino is well marked now but, as there are few distinguishing landscape features, previous peregrinos routinely got turned around. they proved easy prey for bandits (and wild animals) that roamed the hills. we had lots of firsts on our hike from Pamplona to Puente la Reina, foremost being our first really sunny day. a good night’s sleep and wonderful breakfast at the Palacio Guendulain had us leaving a bit later than the previous two days, which made the day even more challenging. leaving Pamplona we walked through the campus of the University of Navarra (you know, the one run by Opus Dei) into a valley where, apparently, the city used to hang felons convicted of theft. beyond the village of Cizur Menor are the ruins of the original Guendulain manor house dating from the 16th century. from here we started an increasingly steep climb up the mountainside, stopping briefly in Zariquiegui to catch our breaths and refill water sacks from the tap next to the church. it was on the ascent into Zariquiegui we saw our first rescue vehicle — a guarda civil followed shortly by some EMT-looking types — assisting someone who hadn’t prepared for the day’s climb or heat. just above the town there’s a fountain of legend — the story goes that the Devil appeared before an exhausted and thirsty peregrino and offered him water if he would renounce his faith; the peregrino refused and Santiago appeared and led him to the fountain that remains today where the Saint offered him a drink from a scallop shell. a hermitage and basilica once stood at on the Puente de Perdón which ran a hospital for peregrinos that is documented to have functioned until at least 1816. the buildings no longer remain, replaced by a line of wind turbines along the ridge — a parque eólico — built in the region around Pamplona. in 1996, the association of friends of the Camino constructed an impressive and evocative monument to peregrinos in the gap of wind turbines along the ridge. both our guidebook and the cultural “handbook” I’m browsing now bemoan the change wrought by the turbines — adding their “pfoomp pfoomp” to “ruin” the peace of the Camino. I cannot agree on this count — the turbines are incredible feats of engineering to behold and this is by far the closest I’ve ever been to one. you see them frequently along the Camino and I found it a great reminder of how the Camino and peregrinos have changed over the centuries. 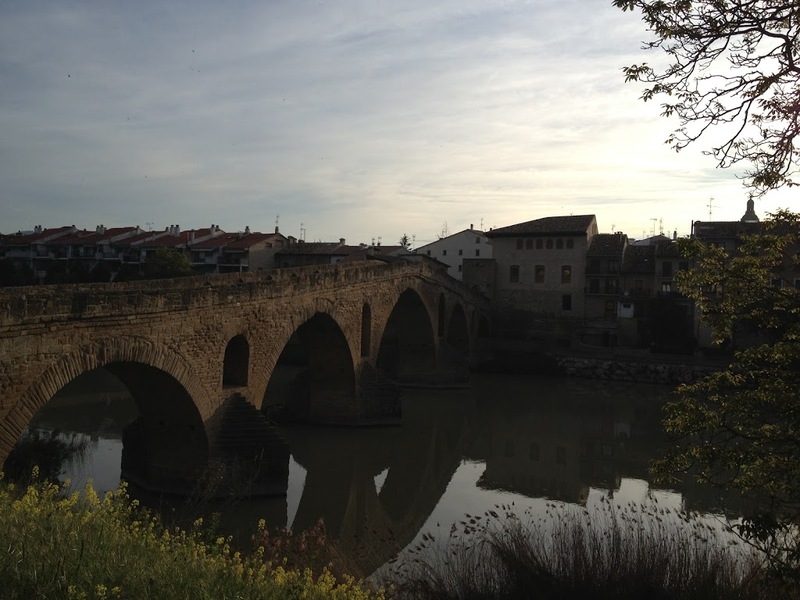 Puente la Reina lies at the meeting of two paths of the Camino – that from France and that from Aragon. not surprisingly, the king established the town in the early 12th century to serve and assist the flow of peregrinos. in the early 11th century, peregrinos had to rely on ferry operators up and down the banks of the Arga to get them across to continue their Camino. not surprisingly, there were some unscrupulous characters operating these ferries doing their best to hoodwink, misdirect, or just plain rob unsuspecting peregrinos. (obviously an age-old problem: who’s going to complain about terrible service when they’re never going to be in that position ever again? and how would you communicate that information anyway? fortunately, we didn’t have much of that on our Camino.) to eliminate this problem, a Queen of Navarra (usually thought to be Doña Mayor, wife of Sancho III of Pamplona, or Doña Estefanía, wife of García III of Nájera) ordered the construction of a bridge over the Agra. the bridge has six arches, the most easterly of which is now underground. When it was built it also had three defensive towers, one of which featured carvings of the Virgin of Puy (which means bird) and which, according to legend, a bird came to wipe away cobwebs and wash the statue’s face with water from the river. the town flourished for several centuries; the Templars were present for a period; several churches were constructed; citizens participated to varying degrees in wars, rebellions and the Carlist wars. besides the bridge, there’s a Templar-built church with a unique Y-shaped crucifix said to have been carried by German peregrinos from their homeland.